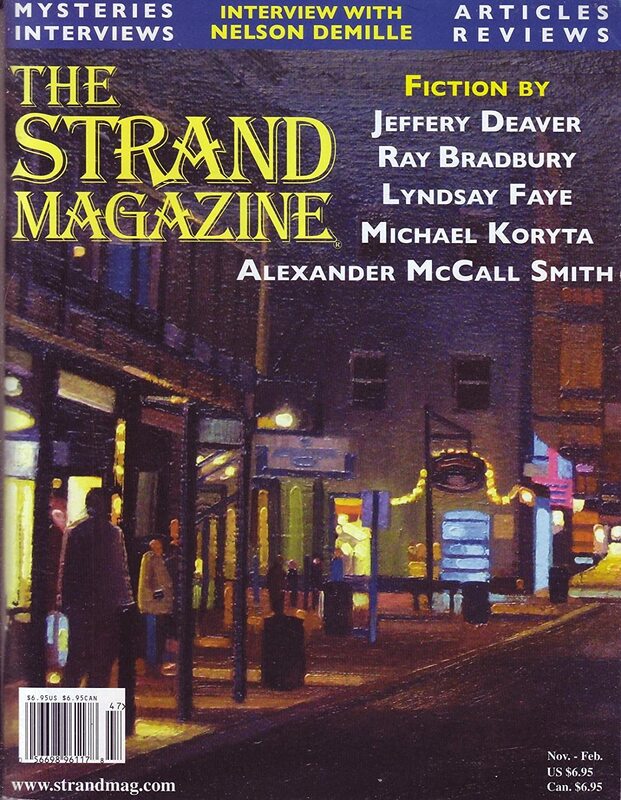 "A People Person," by Michael Koryta, in The Strand Magazine, November-February 2012-2013. The Private Eye Writers of America named the Shamus nominees today and one of them is the story I chose last week: "The Sequel," by Jeffrey Deaver. Excellent choice, but I am still feeling justified in listing Deaver's story and this one as 2013 because 1) I didn't read them until this year, and 2) the issue date covers through February of this year. So there. What Koryta has given us is a lovely little character study about Thor, who has been the hit man for two decades for Belov, who is the head of organized crime in Cleveland. These two have been through tough times on two continents and, in a business that doesn't support long-lasting relationships, they seem inseparable. Thor had seen his father killed at age six, and that was not the first corpse he had viewed. The English word for the way Thor felt about killing was "desensitized," but he did not know that it was a proper fit. Maybe he was overly sensitized. Maybe he understood it more than most. Maybe the poeple who had not killed or could not imagine being killed were the desensitized breed. What could come between Thor and his boss? Could there, to his own amazement, be a line he could not cross? Yup, and a very unexpected one it turns out to be. "The Sequel," by Jeffrey Deaver, in The Strand Magazine, November-February 2012-2013. What do these novels have in common? Well, besides being considered important American novels, they are each the only book by their authors. There seems to be a special catgory in the American imagination for these books that stand alone either because the author died soon after writing it, or because the author chose to give up the field. But imagine if another manuscript by such an author was found. And what if it is a sequel to the classic? That's the concept of Deaver's novella, and it is great fun. Frederick Lowell is an elderly literary agent and one day he gets a letter that hints that one of his deceased clients wrote a sequel to his classic novel. Lowell travels around the country in pursuit of it and - well, a lot of things happen. In fact, it almost feels like Deaver made a list of every way this story could work out and then rang the changes, covering every possibility. In the first half of the story he gives us a classic quest structure but when that ends we get a mystery, one with several red herring solutions, clever reversals and unexpected twists. Highly recommended. "The Remaining Unknowns," by Tony Broadbent, in Mystery Writers of America Presents The Mystery Box, edited by Brad Meltzer, Grand Central Publishing, 2013. True confessions: I am not a big reader of suspense or thriller fiction, and that's what we have here. Mr. Broadbent has presented a fine example of the genre, taut and well-written. I enjoyed it a lot. Bobby is a member of the bomb squad in New York City and he is tasked with disarming a van full of nasty stuff. He reminds us of the saying that when you are about to die your life goes through your mind, and so we see his life, including the tragic circumstances that may have led him to the bomb squad. The story flashes between the bomb job and the story of his life. Love may conquer all, but not all fears. Love opens you up to fear in ways unimaginable before that love ever took hold of your heart. I can walk into the mouth of hell every single day, but I will not take a woman or child I love in there with me. "Newton's Law," by John M. Floyd, at The Big Adios, May 28, 2013. My friend and fellow blogger John M. Floyd is a master of a certain type of very short story. Typically there is a puzzle and a single clue the reader should be able to figure out. Think Encyclopedia Brown for grown-ups. John gets a lot of these stories into Women's World, a market I have, alas, never managed to breach. So what's it about? A lawman and his assistant are bringing a suspect back to town when they get into big trouble. And in a situation like that, who do you trust? That, as Wild Bill Shakespeare said, is the question. "Stimulus Money," by Dan Warthman, in Alfred Hitchcock's Mystery Magazine, July/August 2013. Imagine you have written a story and, lucky you, gotten it published. You want to write more about the same character. How do you go about doing it again, but doing it different? Charles M. Schulz said "A cartoonist is someone who has to draw the same thing day after day without repeating himself." And that is sort of the challenge an author faces with a series. People want to meet the same Sherlock Holmes in every Doyle story, but they want him to be doing something different. In the first story Warthman established a cast of characters: Jones "trying to fit into retirement," his former boss Konnie, who is the jolliest crime boss I have ever encountered, and Akin, the young hitman Jones is mentoring. If all this crime sounds like I am describing a grim story, I am misleading you. They are witty Robin Hood tales in which Jones uses his particular skill set to help out somebody. These days, doing a few pro bono jobs, solving problems for people, civilians. Aggravations and frustrations. Jones cut through the formalities, the rules, the mores, the laws, and gets matters settled. Helps people out. In this case, Akin's mother's boyfriend has gotten into debt with a payday lender of dubious ethics. It might be interesting to compare Warthman's tales to Jas. R. Petrin’s stories about Canadian loan shark, Leo “Skig” Skorzeny, who is always reluctantly willing (if that phrase makes any sense) to get his friends out of trouble. Both series are well-written and fun.